THIS WRITING LIFE: A Writer Writes On! 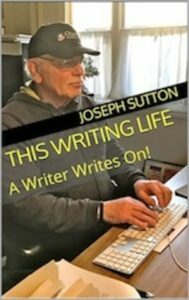 This is the third of Joseph Sutton’s books on writing. It’s not your run-of-the-mill writing book. It’s different because Sutton, a writer of almost 50 years, is a staunch cheerleader for beginning and unknown writers. He believes that any writer who takes his profession seriously is equal to any writer who has ever lived. The reason: every writer has a perspective and voice that is uniquely his own. The main thrust of This Writing Life is Sutton’s “Four Rules of Writing”: (1) Sit down to write, (2) Deadline yourself, (3) Write as fast as you can, and (4) Revise, revise, revise. Due to his belief in these “Rules,” Sutton shows how he gets ideas and makes stories, essays and books out of them. You will get a picture of what it is to be a writer from this book’s 48 short chapters. Every facet of writing is covered: “How to Gain Confidence as a Writer,” “Self-Publishing,” “Selling and Promoting a Book,” “Procrastination,” “Perseverance,” “Overcoming Writer’s Block,” “How to Get Writing Ideas,” and many more. This book is the perfect motivator for beginners and unknowns to sit down and start writing. While being interviewed on the Charlie Rose show, George Clooney said, “It was luck that helped me break out of the pack.” Clooney was a struggling actor who supported himself as a waiter before breaking out of the pack. Luck is a major factor in getting published. I know whereof I speak. My first publisher, Hay House, in 1991, told me that Words of Wellness: A Treasury of Quotations for Well-Being was what they were looking for when my query letter and sample quotations arrived at their office in the days of snail mail. Luck! When I began my writing career I wanted to be as good as any writer that ever lived. It wasn’t until many years later that I realized I was as good as any writer that ever lived. And you, all you unknown writers out there, whether published or unpublished, you, just like me, are as good as any writer that ever lived. That’s what you have to plant in your mind if you’re a serious writer. It doesn’t matter if it’s true or not, you still have to fervently believe you’re the equal of any writer because what you believe is up to you and no one else. Holding a belief like that breeds confidence. You shouldn’t have to wait as long as I did to start thinking that way. When you have confidence you write freely and loosely, you’re not worried about an outcome; you’re putting words down for the joy and pleasure of it. And what arises out of that joy and pleasure is discovering a part of yourself you never knew existed. You’ll say to yourself, “Did I write that? I didn’t know I could write so well.” Confidence, by the way, leads to more production on your part. You’re the equal of any writer because you either struggle or don’t struggle putting words and sentences together. Writers are human beings. They wake up in the morning or afternoon, have their coffee, breakfast, cigarette, alcohol or drug and get to work, just like you and I get to work. They write down their thoughts and produce stories, poems, plays, essays and novels, just like you and I do. Who’s to say that their thoughts and imaginations are better than ours? Why even think that any writer is better than you? They’re not. If they’re famous, they just had luck on their side. Hemingway, Whitman, Twain, Angelou and Cather wrote words and they became famous for their unique voices. Well, you too write words and were gifted with a unique voice, which makes you the absolute equal of those writers. The only difference is, they became famous. Tell me, what is fame other than luck and ability? As long as you have a passion to write and confidence in your ability, that’s all you’ll need to keep going as a writer. Here’s what it all boils down to: you’re as good as any writer—that is, if you take writing seriously and have confidence in your ability. All you need to do is write and keep on writing and maybe someday luck will be on your side.